The mayor wants 400 free hotspots next year: The city will allow use of public property to assist in antenna location by private firms who will obtain contracts. The proposal will also cut fiber optic fees to promote extension of those lines to 80 percent of Parisian buildings by 2010. El Pais reports that about 6m Spanish computer users connect via Wi-Fi, primarily in the largest cities: THe paper puts Madrid and Barcelona in the top two positions, with over 800,000 users and 700,000 users, respectively. Valencia, Seville, and Bilbao are 3, 4, and 5 with substantially fewer (about 300K, 250K, and 150K). The top six cities have about 2,500 commercial hotspots, half of which are in hotels, bars, and restaurants. This makes perfect sense: As handheld devices increasingly have Wi-Fi, it’s much more likely to be used by those who frequent a pub. Laptops? Not so likely. The Cloud’s UltraWiFi offering provides unlimited usage on its network for £11.99 ($22.50) per month with 1-year commitment: The subscription will be available starting 1 July 2006. This is a shot across the bow to every single other Wi-Fi provider in the UK, where rates are typically astoundingly and irritatingly high compared to the U.S. and Asia. Europe has generally remained at a two to three times multiple over prices in those regions. UltraWiFi comes in two flavors: Monthly for £11.99 with a one-year commitment, and weekly at the same rate of £11.99 but on a pay-as-you-go basis. That is, a week of unlimited Wi-Fi (any week you choose) is the same as a month without the ongoing commitment. Because The Cloud has over 7,000 locations, including railroad stations, hotels, and airports, this pricing should produce a squeeze on competitors operating in similar venues, notably T-Mobile UK. The Cloud will start offering city centre service in the City of London soon, and in eight other UK centres in the coming months. This kind of pricing and coverage makes Wi-Fi a practical alternative to mobile phone service, or at least a good complement for dual-mode phones. The Guardian writes more about this. In the U.S., T-Mobile offers unlimited Wi-Fi at about 7,000 locations (mostly retail, but some airports) for $20 (£11)/month for voice subscribers or $30 (£16)/month for others (1-year commitment), or $40 (£22)/month on a month-to-month basis. In the UK, T-Mobile charges £23.50 ($44) per month for unlimited usage. That’s a huge differential; it may boil down to which venues people use. Update: An alert reader noted that T-Mobile UK has a very aggressive 3G cellular data plan that throws in Wi-Fi access. Sign up with a 12-month plan for Web ‘n’ Walk Professional and get a PC Card, quasi-unlimited 3G service, and 12 months of unlimited Wi-Fi service for £20 ($38) per month. The card is £60 with a 12-month plan or free with an 18-month commitment. (Quasi-unlimited? Like most cell operators, T-Mobile says any word means whatever they want it to mean. A long footnote explains that usage of more than 2 GB of data transfer per month will be scrutinized, and you could be throttled down after two consecutive months of such use. VoIP is prohibited.) In the US, T-Mobile offers unlimited GPRS plus unlimited Wi-Fi to voice subscribers for $50 per month with a year’s commitment. Subscribers of the two networks can roam across networks: T-Mobile has over 700 hotspots in the Netherlands. Royal KPN has about 650. This deal covers just the Dutch locations, despite T-Mobile’s several thousand other European locations and nearly 7,000 in the U.S.
Trustive adds 1,400 hotspots: Trustive resells access to its aggregated network of hotspot providers. They just added AWA in Spain (1,200 locations), Wiera in Hungary (160), M3-Connect in Germany (75 large venues), and Mobitel in Slovenia (55 varied locations). BBC’s Mark Ward writes about the social change that ubiquitous Wi-Fi might bring: The UK is booming with wireless networks, with the latest announcements offering seamless coverage across The City of London and Canary Wharf. There’s a growing expectation that ubiquitous high-speed Internet access will transform how companies work. Telecommuting versus mobile computing, let’s say. Likewise, customers will soon be computing everywhere, too, changing what companies need to provide to them. Accompanying the main article is a separate piece defining some terms, but including two great graphics: one shows how a hotzone works. The other identifies areas in England and Scotland and within London that have or are planning to add hotzones. Thames Online Service adds eight miles of river-covering Wi-Fi: Ah, punt down the Thames in London (if you dare) and use free Wi-Fi during this trial phase. It will later be US$5 an hour. AWA will deploy thousands of new hotspots for a total of 12,000: The company has 4,000 hotspots already deployed, and will use Meru and Firetide gear (via distributor Optical) to move to 12,000 within two years; 4,500 will be at gas stations. The hotspots will support VoIP via Qtek phones that handle both VoWLAN and GSM. Quiconnect arranged the roaming agreement for The Cloud’s network via RoamPoint, which is itself a wholesaler of hotspots operated by other parties. These deals have become quite baroque. In the end, the amount of interconnection, roaming, and bilateral access means that the hotspots available to any user on any network continues to grow. Most of these additions are metered, however: it’s a single login, single bill, but not a flat price, even if there’s an unlimited domestic or home-network rate. Surf and Sip is the latest Wi-Fi hotspot operator at the London airport: The official launch is January, but the service is up and running in departure lounges in all four terminals. The airport is unique in having three operators now: BT OpenZone, T-Mobile UK, and Surf and Sip. I’m only aware of one other airport with a second terminal-wide coverage operator—Dallas, Texas. Surf and Sip is moderately well known in the States where’s been operating since 2000 in coffeeshops and restaurants starting in the San Francisco (Calif.) Bay Area. It expanded overseas two years ago and has extensive locations in Eastern Europe and the UK. The hotspot operator is competing on price, according to this Nancy Gohring story over at InfoWorld: £5 per day versus T-Mobile’s £10 and BT OpenZone’s £13. All other things being equal price sensitivity and price shopping could provide the company with much more usage. The story notes that the company’s founder spent two years negotiating with the airport authority to obtain approval after a skunkworks hotspot was removed. Orange You Glad You Already Had Wi-Fi? Orange launches late, expensive Wi-Fi service: It’s £6 per hour with their UK launch. It combines Wi-Fi, GPRS, and 3G service. 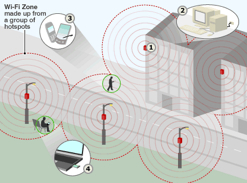 Wi-Fi in the UK will be provided through partnerships with WeRoam, BT, and BT OpenZone. Each 60-minute chunk of Wi-Fi, triggered by a text message, can be used throughout the network over 24 hours, which may lightly justify its high cost. Former WNN staffer Nancy Gohring writes about the European group Fon, which aims to spread grassroots Wi-Fi roaming: The Fon system requires the use of a Linksys gateway with new firmware they provide; they’ll offer the firmware for other gateways in the future. Fon has an eco-system of Bills, who charge for hotspot access; Linuses, who offer it for free; and Aliens, who pay to use hotspots. Linuses get free access on the Fon network, no matter what kind of hotspot, because they’re offering free service. The idea is quite similar to the original business models of both Sputnik and SOHOWireless, and the failed Joltage (second item on linked page). All three firms tried to build grassroots or community-organized hotspot networks that would rapidly expand. They suffered from a lack of hardware and a lack of momentum. In an era when any dense neighborhood has plenty of accidentally public networks and purposely free ones, Fon may be already behind the time. I noted the other day that Estonia is tops in Wi-Fi, Lithuania is starting to roll out wireless broadband and hotspots, but Latvia was missing from the picture: Now I see it’s all about timing. Lattelekom has 150 hotspots deployed, 75 percent of them in the capital of Riga. This article notes there are 45,000 laptop owners in Latvia but 3,500 being sold each month. The telco will increase the total to 200 during 2005, and add 150 more (or is it 350 more? it’s ambiguous) in 2006. Costs are roughly US$1.60 per hour or US$16 for 24 hours. Service with a monthly commitment is about $5 per month for a US-cent per minute rate or about US$17.50 per month for unlimited use. Lietuvos Telekomas has 100 active hotspots: They’ll have 300 in place by the end of 2005, with no plans to charge until next year to boost interest. Wi-Fi hotspots are being installed in major cities like Vilnius in locations such as cafes, filling stations, and shopping centers. My father’s family all came from one small town in Lithuania—Janova—and I’m proud to see my homeland cut the cord. Ireland Offline needs a new spokesperson: John Timmons, the broadband advocacy group’s talking head, said in this article that all of Ireland could be served by just 50 mobile WiMax base stations using technology that should be available by 2008. Oddly, EarthLink’s winning bid a few weeks ago requires the company to cover all expense and meet the proposal’s pricing structure. As far as I know, Philadelphia always planned to contract this out, too. The article does bring out a usual complain that’s been hampering the growth of competitive wireless networks: putting up masts (or poles) on which to mount antennas. Real estate rights remain a key challenge in metropolitan-scale deployments. The Chambers of Commerce across 18 Irish counties will work with Eircom to add over 400 new hotspots: The hotspots per town will average 20 to 30, and the company estimates an increased reach of 500,000 people. The new services runs £49 for 4,000 minutes of Wi-Fi, 75 MB of cell data per month: BT Datazone works at 7,800 BT Openzone hotspots and on GPRS and 3G networks. The Register article says the service will work worldwide on 30,000 hotspots. No note about roaming charges, however, if any, and there’s no information on BT Openzone’s site yet about this plan. Wivanet will be offline by early next year: The hotspot network hasn’t seen enough usage for the company to continue to invest in it. The firm to which Vantaa sold its ISP business has no interest in taking over the hotspots. Finland is so cell-phone based, it’s possible—as the article notes—that residents are fixated on next-generation cellular. ADP Télécom operates several French airports, along with prominent hotesl and business venues: Quiconnect doesn’t provide a count, but this is a very strong addition to their portfolio. Some U.S. telecom operators resell Quiconnect’s portfolio as international Wi-Fi roaming has become increasing important to their best customers. T-Mobile added nine access points in the Lake Balaton region of Hungary: The hotspots will cover marinas on the lake. T-Mobile has 85 hotspots in Hungary. BT Openzone has built six hotspots in Glasgow’s city center: The hotspots cover the main shopping and business areas. The goal is to allow city workers to use the network. Skype users can make, receive calls at 6,000 The Cloud hotspots for a fee: Skype Zones puts Skype into hotspots via laptops without allowing other services at a reduced rate compared to Wi-Fi access. Tony Smith at The Register notes that The Cloud already had a Skype Zone via the Boingo deal which encompasses The Cloud and 12,000 other locations. Unlimited access to the still-in-beta Skype Zones costs €2.50 for two hours or €6.50 per month. Pricing may change, The Register says. Swisccom Eurospot will offer hotspots in Hilton hotels in Western and Eastern Europe: The move offers Swisscom Eurospot an entrance into some new markets. Swisscom’s pricing is quite high but Hilton caters to the business traveler and the higher end market so those customers may be able to afford it. BT’s chief of wireless broadband thinks that media reports covering security issues with Wi-Fi may deter usage: I’m not sure what he’s suggesting—that we don’t write about security problems? That’s hardly a solution. It’s better for users to know the risks so they can do their best to protect themselves, rather than start using Wi-Fi blind to the risks. The threat of less usage due to security concerns can also spur the industry to improve security. BT’s reaction to the hysterical stories that may exaggerate the problems should be to help set the record straight, not try to suppress all coverage of the topic. Contrast BT’s attitude with T-Mobile’s: on the T-Mobile Web site, they spell out the risk in gory detail: “As with any high-speed wireless service, the T-Mobile HotSpot network is not inherently secure. Furthermore, wireless communications can be intercepted by equipment and software designed for that purpose.” Of course, T-Mobile has been offering 802.1X authentication—each account gets a unique strong session encryption key when a user logs in using this process—for several months in the U.S.
Telebria is offering a portable hotspot: Users connect to the hotspot via Wi-Fi and the access point uses 3G or GPRS for backhaul. The access point can also detect if it is in range of a Telebria mesh network and if so, it can use that network for backhaul. Telebria calls this the “first” portable hotspot but it’s not. In March, O2 said it would start selling a device from Novatel that uses 3G for backhaul and Wi-Fi for access. And last year a company called Junxion began selling a similar device. The Telebria access point supports data cards from Vodafone, O2, T-Mobile, and Orange. The press release should eventually appear here. BT Openzone is building hotspots in three BMW showrooms in London: BMW drivers can access the network while they wait for their cars to be cleaned or repaired. The access isn’t free. A couple of car dealerships in Atlanta in the U.S. have introduced Wi-Fi in their showrooms. Like the BMW offering, the service is aimed at people who are waiting for repairs to be completed. Eircom is offering cafes and other venues a Hotspot in a Box service in Ireland: Venues buy an access point from Eircom which is configured to link back to Eircom’s authentication and payment systems. Eircom essentially sells sign-in vouchers to the cafe at a 25 percent discount. The cafe in turn sells the vouchers to end users. Eircom hotspot subscribers can also use the hotspots. Cafes can also opt to pay Eircom �50 per month and offer customers 30-minute free-access vouchers. In both cases, the cafe pays for its own DSL line for backhaul. This is not a particularly good deal. While it takes care of billing and potentially draws existing Eircom hotspot customers into the venue, it appears that there is no setup or ongoing technical support. Venues also have to charge customers an exorbitant �10 per hour if they want to earn any share of the revenue. To be fair, that price is fairly standard in Ireland for hotspot access but it doesn’t allow venues the flexibility of charging what they like. Bitbuzz, a hotspot operator that offers to build and maintain networks for venues, isn’t worried about the potential new competition. BT began making a similar offering over a year ago and while Bitbuzz was initially concerned about the potential competition, it didn’t ultimately make a difference, said Alex French, operations director at Bitbuzz. The Eircom and BT offerings could affect Bitbuzz’s efforts at winning customers on the low-end of the coffee shop market, but French doesn’t expect to notice much an impact. Bitbuzz pays for and installs the access points and asks locations to buy a certain amount of network usage time each month. The venue can choose whether to give access to customers for free or charge any fee they like for access. The Hotspot in a Box may be part of a larger change in hotspot strategies at Eircom. In December, the company introduced free access to hotspots that were delivered from Eircom pay phones. I noticed yesterday that at least one of those hotspots now requires a fee for access and I’ve heard that some of the other phone booth hotspots have gone down or are also now charging fees for access. I spoke with an Eircom press representative a couple of weeks ago who said the company was re-evaluating the phone booth concept and he wasn’t able to give me additional details at the time. Editor’s note: Please note that an earlier version had Eircom offering a 75 percent discount on vouchers. Thanks to Alex for the correction. MCI business customers can access Boingo hotspots in the United States, Europe, and Asia-Pacific: The deal is part of MCI’s Remote Access Service, an offering used primarily by traveling business people to access the Internet. The agreement means those customers can access an additional 3,400 hotspots in the U.S. and 1,300 in Europe and Asia-Pacific. MCI’s Remote Access Service already includes 6,200 hotspots. This agreement puts MCI in league with some of the other big consolidators that offer wired and wireless access to traveling business people. The wording in this press release and the subsequent coverage I’ve seen is really vague about where the hotspots come from, with only a sideways mention of Boingo. But after a couple of quick emails to a helpful press representative at MCI, it sounds to me like this is a standard Boingo deal for MCI. Reader David Kelly, a student at University College Cork in Ireland, offered us his two cents on Eircom’s possible strategy behind offering Wi-Fi access from payphones: I set out one day to try to use some of the free access offered by Eircom from pay phones around Dublin only to discover it wasn’t very practical in rainy Dublin to find a place to sit outside nearby one of the payphones to get online. Kelly points out that Eircom is required by ComReg, the Irish regulatory agency, to continue to provide payphone service. Adding Wi-Fi to the payphones is relatively simple—Eircom only needs to upgrade the line for DSL and add an access point. While the Wi-Fi access is currently free, the trial may be an attempt to discover if Wi-Fi could ultimately earn some revenue for Eircom. With mobile phone penetration reaching nearly 90 percent in Ireland, I can’t imagine that Eircom makes much money from the payphones. Kelly also points out that Eircom sells ad space on the phone booths and also plasters its own advertising on the booths. Both are attempts to leverage the fact that they are required to continue to support the pay phones. Kelly also suggests that Eircom might do better to add the Wi-Fi access to indoor pay phones, which may be located in train stations or shopping centers or high-traffic locations. That would make a lot more sense than the outdoor offering.